If you’re now a mom who grew up in the 80’s, chances are you rocked out to at least one “Jem and The Holograms” episode in your life. Okay, admit it, probably dozens more! 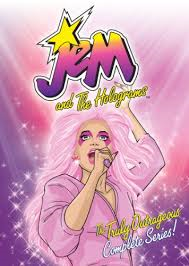 In case you were living under a rock during the 80’s, Jem is the alter ego of Jerrica Benton. Jerrica has these super-cool star earrings and an out of this world computer named Synergy that help transform her to the pink-haired rocker Jem, lead singer of the totally rad Holograms. Jerrica’s little sister Kimber is part of the band along with friends Aja and Shana. Of course the Holograms have an enemy…The Misfits. These girls look like a cross between KISS and Poison, but with a bad girl attitude. They’re no Debbie Gibson or Punky Brewster. Pizzaz is the lead singer of The Misfits and would love to pull a Karate Kid on Jem and her little Holograms. Her little crew get into it with Jem in every episode. It’s fan-flippin-tastic. And who could forget Rio! Rio is Jerrica’s boyfriend/Jem’s stage manager. I think every little girl had a crush on Rio growing up! So, why am I going on about an 80’s cartoon that has long been canceled? Because my girls are now rocking out to Jem too some 25 years later! One morning during their spring vacation last week I was flipping through the kiddie channels and stumbled upon Jem on the Discovery Family channel. Transported back to my electric youth, I made my girls watch it with me. They asked a lot of questions about this Jem person. Why is she two people? Why is Pizazz so mean? Why do they all have different colored hair? I could go on, but you get the point. After about ten minutes, they were hooked, cheesy music and all! Another episode followed and they sat down and watched the entire thing, then asked for more when it was over! This was truly outrageous! On Saturday morning they woke me up at 7:15 to ask for Jem or as my three-year-old calls her “Hem”. They were actually disappointed that it wasn’t on during the weekend! This was so “out of the blue”! I felt like this could happen “only in my dreams”. But, I really was reliving my “Electric Youth”. It was so refreshing and such a nice change from our usual “Lalaloopsy”, “Kate & Mim-Mim”, and ” Max & Ruby” cartoons. Needless to say, I’m ready to relive my 80’s childhood with my girls. I even hear a Jem movie is in the works! Now, if I can only find my Jem dolls! Hmmm…. Truly outrageous!! Rio was so dreamy! I loved this. I wonder if I can get it on DVD – I would really love to watch with my girls. Thanks for the amazing trip down memory lane! Glitter’NGold! I was such an enormous Jem fan. I had several dolls, fashions, the waterbed, the Panini sticker book which had stills from the original Jem TV movie (3 episodes strung together!) I haven’t bought the DVDs yet but I do remember the Jem MTV doll jacket offer! Beware-stick to your DVDs -the new film does not stay true to the characters or their origins. ForeverJemFan, sincerely, Amy Green. Yeah! I wish I saved the dolls for my girls now! love that! thanks for stopping by! I suspect I may even have some of those dolls in storage somewhere. Stormer (the Blue haired Misfit – I think that was her name) was my favourite. I loved Jem when I was younger and the whole Jerrica/Jem and Rio love “triangle” is bizarre but entertaining all the same. Plus the Misfits are bad… like really bad! They’re constantly putting Jem and the Holograms in life threatening danger. I love the throwback! My hubby introduced HeMan with no success. Glad you and your girls are having fun! I loved HeMan too and SheRa! Thanks for taking me down memory lane! I never missed an episode of that show. omg I was just watching Jem on Netflix last week!!! Best cartoon ever!! !